Have really fully settled on the OSX operating system and Apple hardware and in the last years I was indeed very satisfied – not necessary in terms of performance but clearly ergonomics and usability of the Apple ecosystem is working and most important it just lets you concentrate on doing things. Thats clearly what I learned to appreciate – and yes I also was a Linux fan in the early days and for mass satellite image data processing I am still using Linux servers as number crunchers but for everything else / DTP/Imaging the Mac is it – may be “was it”? The Late2016 version of the trusty workhorse the MacBook Pro is just a very mixed bag. Performance wise the fast SSD is nice and faster GraCa is good – so yes its faster but not by very much! Agisoft Photoscan is clearly very much accelerated – I guess by factor 2 (compared to the full speced-out 2013 model) but thats mainly due to the faster Radeon Pro460. RAM/CPU performance / specs havnt changed much. Overall yes the system is faster / more responsive. I think the performance issue of the new MBP late2016 is the main issue with this MBP update but the reduction to USB-C, +the battery capacity issue – are just adding to this problem. Having 16GB RAM might seem to be enough for most but if you run a virtual machine often, than 32 GB RAM provides a real speed boost – and its NOT an upgrade option with the new MBP late2016 version. With full res smart previews in Adobe LR and working with the full res original files this MBP seems to be just overstrained, as was my late2013 version of the MBP. You have to shutdown everything else to let LR run full throttle and this is using the GPU allready. Maybe LR ist not yet able to use the GPU to its full potential, but I hardly see a big speed boost compared to the MBPlate2013 – and the late2013 was also a fully out-speced MBP. Look at how these different MacBookPro generations (that I used since 2011) compare: the 2010 17inch is still running without hickups. Fig. 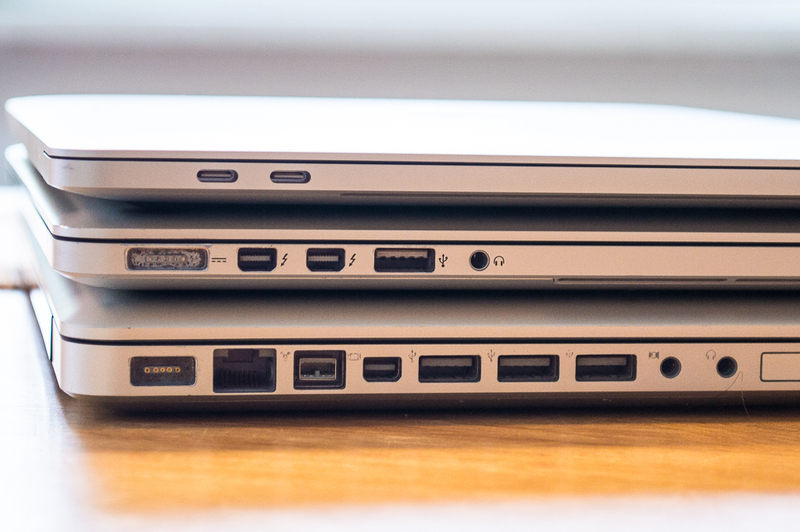 : Below: Mid2010 17 Inch MBP, middle: late2013 15 Inch MBP, above: late2016 15 Inch MBP, what is next? I will clearly have to add a hyperdrive. Nobody who really uses these notebooks on a daily basis and who travels every week wants an even thinner MBP13/15 than what the MBP2013 was – Its light already for what it does – why make it even thinner and smaller and compromise battery capacity? Give us the usability that we need (Thunderbold2/3 & 3x USB-3/C & a SD-Card-Slot, +strong battery performance) and Kensington Lock /MacSafe would be also nice. Why kill something than works? (MacSafe). Right now I even need a converter to add my Iphone to the game! I just dont get the decision to go for USB-C as the one and only connection option. The Hyperdrive solution gives all these old connections back (although without adding the Thunderbold2 access) and it sold like hot cake in the last months. Btw: I really like the TouchBar – its cool for everything that needs some very precise scrolling /video/audio tracks! – but the TB has to be integrate in more software solutions (Adobe?). So far the full potential of the TB cannot be fully utilized AND its too sensitive – you often hit it by accident. I also believe that it should have more custom functions. Its not possible to have the standard bar expanded all the time without disabling the app specific touchbar functions. Thats not ergonomically useful. You do not want to expand the brightness and/or speaker volume slider to modify the settings. It should be right there. To do that you have to disable the automatic App specific function-switching. SSD is damn racing fast! a big plus. Battery life is compromised (smaller battery) for the Radeon460 config. You end up with 3hours when you put stress on the CPU/GPU. Touchbar nice for scrolling but hasnt been integrated in all important apps yet. Why-o-why did Apple kill Macsafe? you will need a new set of peripheral add-on devices to connect to your individual devices. No Magsafe2 converter! No converter included? Seriously Apple should at least include 2 converters when you buy the new MBP (USB &TB2).